In our second instalment looking at chord sequences used by Queen, we find that in among the band’s stock-in-trade, there were quirky, original songs which owed much to the music of the 1920s. These include songs like Bring Back That Leroy Brown, Lazing On A Sunday Afternoon, Seaside Rendezvous, and Good Old-Fashioned Loverboy. 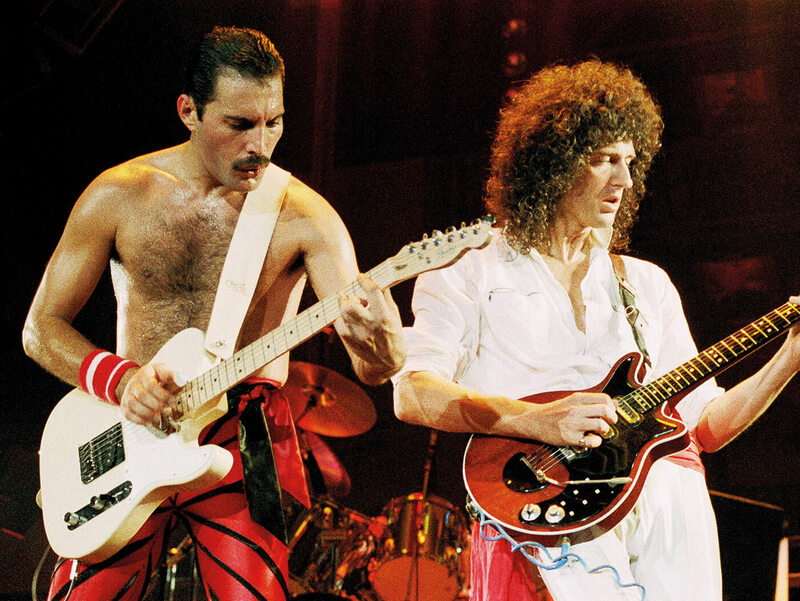 The chord sequences in these songs will be unfamiliar to most rock guitarists, as they are derived from an era when jazz was the dominant force in pop music. Diving straight in with figure one, we find four chord shapes that are all played on the top four strings of the guitar. Play four downstrokes on each chord for a jazzy approach, looping the pattern around, or even better, go for a Charleston rhythm, playing on the first beat and on the ‘and’ between the second and third beats of the bar. If you can get round the shapes quickly enough, go for a fast tempo and you’ll capture the hot jazz style we are aiming for. Incidentally, the small zero in the second chord is an abbreviation for diminished, so C#o7 means C sharp diminished seven. Figure 2 is essentially a reworking of figure 1 – giving you another way round a similar set of chords and making an eight-bar sequence altogether. Use whichever finger is on the fourth (D) string to mute the fifth (A) string, as that way it won’t matter if you catch it with the pick; avoid hitting the sixth (low E) string altogether. 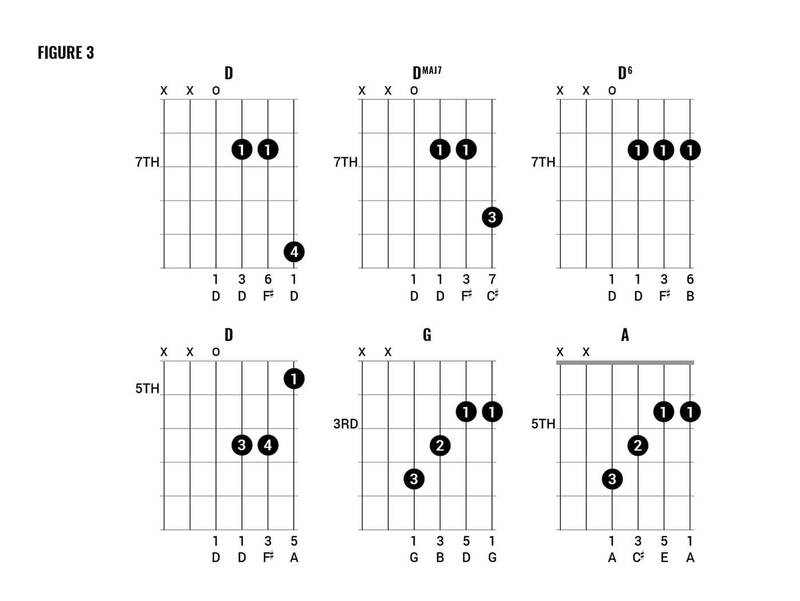 You might notice that the A9 and G7#5#9 chords both omit the root note. This is not unusual with this type of chord progression, where the root note is implied by the movement of the chords; if you want to put the root note in, in both cases it’s available on the fifth (A) string. The six chord shapes in figure 3 also make up a four-bar sequence. Give the first four chords two beats each, and then give the G and A chords a bar each. We are mixing high-position chords with the open fourth (D) string in the bass. As a variation, you could go back over the D6 and D chords one time and halve the amount of time on the G and A chords. Repeat, and you’ll have an eight-bar sequence. We are aiming for the kind of song that often has an AABA structure, so repeat this eight-bar A section before we head into the B section. Cue figure 4 and the B section, also known as the bridge or the middle eight. Strangely, a middle eight isn’t always eight bars long, but in this case, if you play the first three chords for two bars each, then E7 and Bb7 for two beats each – before giving A7 a whole bar to itself, possibly as a held chord – it will come out at eight bars. At this point, you go back to the A section to complete the AABA structure. 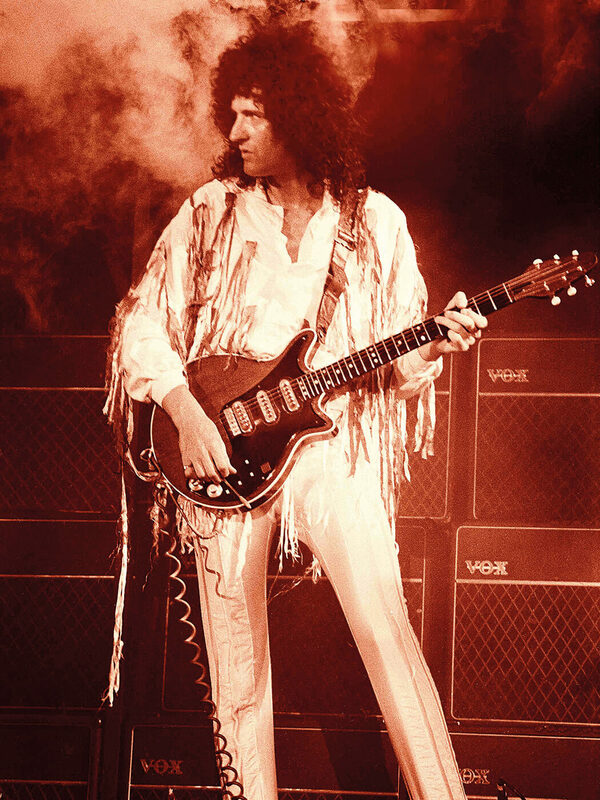 Jazz players often solo over the entire form on songs like these, but given Queen’s rock-band credentials, it’s more likely that Brian May would just grab a melodic eight-bar solo over either section. Give it a try, but you might find that those dependable minor-pentatonic shapes don’t quite deliver the goods, especially on that tricky middle eight. Guitar players can do a good impersonation of the ‘oom-pah’ rhythm often found in early jazz. 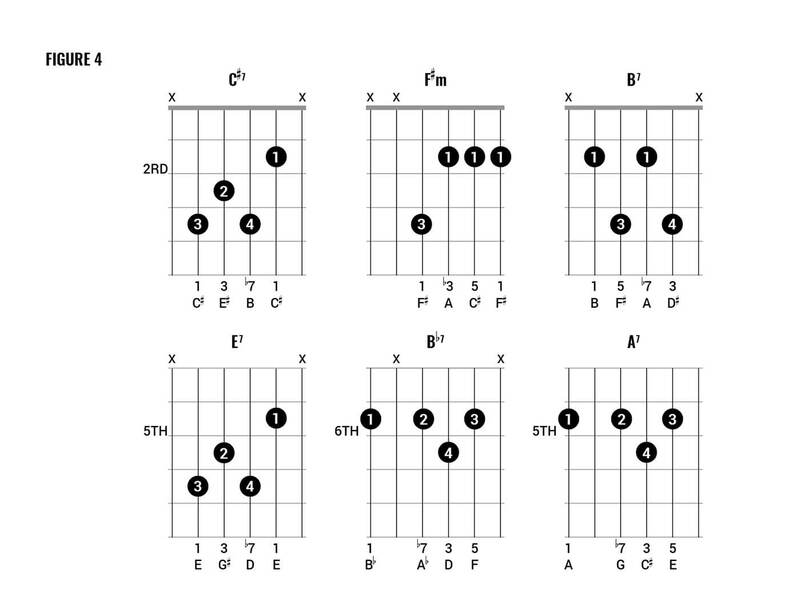 Take a look at figure 5, which starts with a C major chord followed by a slash chord, which is C major with a G bass. The idea here is that you pick the C bass on the first beat of the bar, and hit the other three notes of the chord with a downstroke on the second beat. You should find that using the third finger as a barre naturally mutes the open first (E) string, which is what we want. For the third beat, pick the G bass note from C/G and strum the other three notes on the fourth beat. Perhaps it’s more ‘boom-chack’ than ‘oom-pah’, but hopefully you’re getting the idea. If you can’t hold down three strings with the third finger, use fingers two, three and four instead – don’t feel bad, some people just don’t have the flexibility in the tip joint of their third finger! Now move on to the G7 chords – alternating between G and D in the bass, with the strummed chords on beats two and four. Play two bars of C, two bars of G7, or any other pattern you can think of, and repeat. Try a jaunty tempo – and your seaside rendezvous awaits. Check out part one of this lesson here.